Magnesium Gold features elemental magnesium chelated to a full-spectrum amino acid complex derived from enzymatically hydrolyzed organic rice protein. Magnesium Gold is manufactured in the USA to industry-defining quality standards and is verified by independent third-party labs to meet identity, purity, and potency label claims. Magnesium has garnered a lot of attention in recent times and is becoming increasingly popular because of the important role it plays in promoting heart health, activating enzymes, supporting cellular energy, maintaining pH balance, and supporting bone health. Although magnesium can be found in a wide variety of foods, including leafy green vegetables, whole grains, seeds, nuts, corn, coffee, and dark chocolate, most adults fail to consume adequate amounts of magnesium in their diets. Rather than being chelated to a single, chemically produced synthetic amino acid (e.g. glycine or lysine), the magnesium in the reformulated Magnesium Gold product is chelated to a full-spectrum amino acid complex derived from enzymatically hydrolyzed natural rice protein, which is both hypoallergenic and gluten-free. 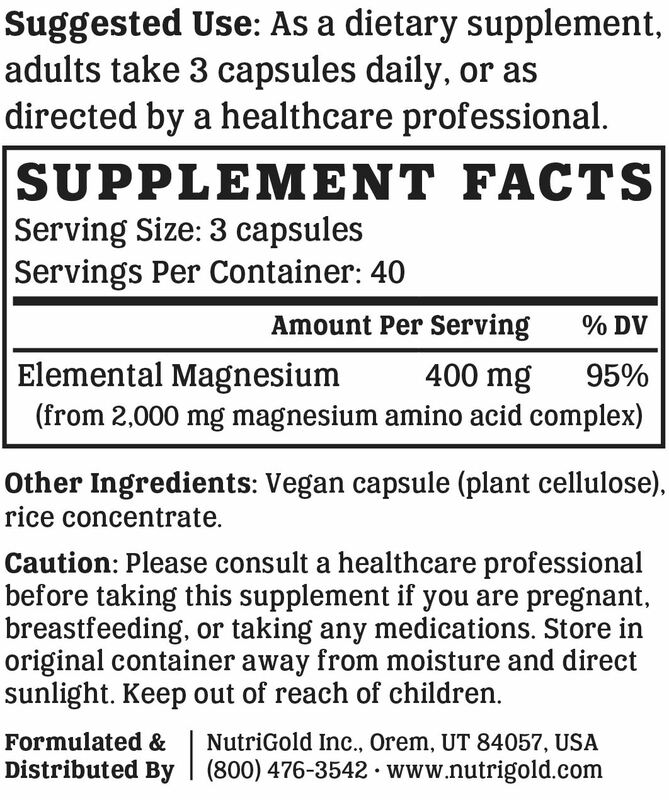 There are a couple of benefits to chelating magnesium to a full-spectrum amino acid complex rather than to a single, chemically produced amino acid: (1) the product delivers a complete amino acid profile including 'essential' amino acids that must be consumed in the diet because the body is unable to produce them; and (2) there is some scientific evidence (Mackenzie, Loo, Fei, et. al., 1996) that amino acids are taken up in short chains and not as single molecules. The process used to chelate the magnesium in our product delivers the mineral sequestered in these short chains thus harnessing the body's own uptake mechanism to deliver highly available mineral nutrients. Magnesium Gold is Non-GMO Project Verified, which provides assurance that the product has been manufactured in accordance with the best practices for GMO avoidance. The Non-GMO Project is North America's premier verification program. Vegan Action has offered vegan certification since 1995. Their official seal is proof that Magnesium Gold does not contain ingredients derived from animals or animal by-products, is free of animal-derived GMOs or genes, and is not the subject of ongoing animal testing. Most consumers consider kosher products to be cleaner, healthier, or better than non-kosher products. The Ko Kosher symbol on Magnesium Gold is assurance of our brand's unwavering and uncompromising commitment to accountability, quality, and overall safety. We like to make supplements that can be enjoyed by everyone. That's why our products are always compliant with the best practices for avoiding allergens and minimizing cross-contamination. Magnesium Gold is free of soy, gluten, egg, milk, peanut, shellfish, and corn allergens. Consistent with our guiding principle to “do no harm,” Magnesium Gold is manufactured without the use of additives or preservatives. It contains absolutely NO contaminants, pesticides, herbicides, harmful additives, residual solvents, magnesium stearate, or hexanes. Like all NutriGold products, Magnesium Gold is subject to over 140 purity and potency assays by independent, third-party labs to ensure that the product meets or exceeds its claims. So, you can be certain that what's on the label is what's in the bottle. Nothing more, nothing less.